El alcaparrón is a caper flower of high quality. It is mostly eaten in the southern half of Spain, as a snack in cocktail buffets. Caper flowers are are capers with their tails before blooming period. If capers (the fruits) are not picked early, they grow at the end of a stem (caper tail), before blooming into a beautiful white flower bedecked with purple pistils. The harvest can only be done by hand given the size and delicateness of this product. 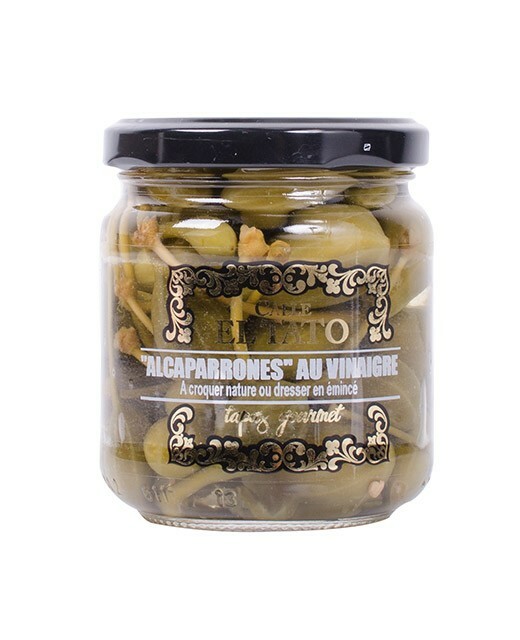 The capers with tails that we provide you with are the smallest type, which also is the tenderest. They are soaked in a wine vinegar and salt mixture, without any preservatives. Capers with tail, water, vinegar, salt, bay tree leaf. 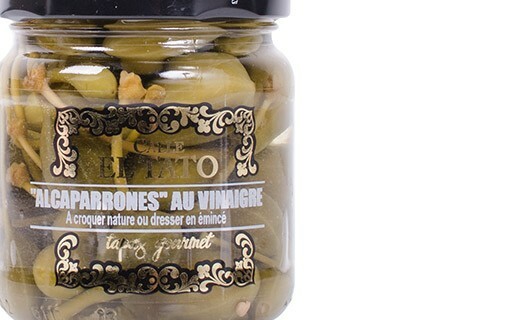 El Tato offers numerous products from the Iberian gastronomy.